While the weather continues to improve we've compiled a list of our favorite listings with Instagram worthy terraces where you'll want to be outside all year round without leaving your home. With a rooftop pool or a kitchen to grill year round you can't go wrong with these options. This luxurious Manhattan Penthouse provides the unique opportunity to own a 2,350 square foot bi-level private rooftop terrace with a pool detail. Three sides of floor-to-ceiling Nano doors seamlessly blend the indoor living space with the outdoor roof decks. Whether relaxing by the fireplace or entertaining on the double-level terrace, the features are endless. In the center of the outdoor area is a top-of-the-line Kalamazoo stainless steel kitchen, which includes a 60-inch hybrid grill, a beverage center, a wine fridge, an ice maker, a dishwasher, endless counter space, and a large sink. Here, the city skyline steals the show; from One World Trade to the iconic water towers of SoHo. Completing the terrace experience is a ten-person custom stainless steel water installation and a 55 inch outdoor TV with surround sound. Prepare to be wowed as you step on the 2,200+ SF landscaped roof deck; it is truly astounding. An entertainers delight, no summer home required! With its custom kitchen and bar outfitted with Kalamazoo appliances, you will only need to choose your favorite angle, your favorite view, as your private oasis offers multiple lounging and dining options. The Townhouse at The Hubert. Have it all with this quintessential family home at a premier full service condo located in the heart of TriBeCa. This extra wide, sun flooded townhouse is perfectly divided into three levels consisting of 4 bedrooms and 5.5 baths. A gracious entryway leads to the main floor including the kitchen with top of the line appliances and an open dining area. Through the kitchen is the private parking garage with accessory space, which can easily be reconfigured to its intended fourth bedroom with separate entry. The center of the home is the expansive 32' wide great room with 12' ceilings and a decorative white onyx fireplace. Massive California doors open out to the secluded 800 sq. ft. patio, complete with an oversized Sundance Spa. This one-of-a-kind Penthouse features inspirational five-borough views, from sunrise over Prospect Park, north to the New York and Brooklyn skyline and beyond, to the sunset past New York Harbor, and south to the Verrazano Bridge. 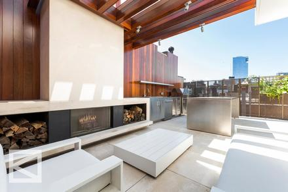 With private wraparound terraces surrounding the apartment, this stunning Brooklyn Penthouse will make you feel like you've stepped into a sanctuary, full of warmth, air, and light, every time you arrive home. With multiple terrace exits, you'll enjoy inside/outside living from your bird's-eye perch. In the winter, cozy up beside the working fireplace with a view over your domain. 327 East 9th is a one of a kind boutique rental building that redefines the townhouse experience. Perfectly located on an intimate, tree-lined street in the Heart of the East Village between 1st and 2nd Avenue. This triplex residence features: 3,700 Sqft, 5 Large Bedrooms, 4 Full Bathrooms and 1 Half Bath,Private Keyed Elevator, 5-Fixture Master Baths with Radiant Heated Floors, Private Roof Deck with Full Outdoor Kitchen, Private Balconies with Wrought Iron Railings, Floor-through Living and Dining, Radiant Heated White Oak Chevron Floors, Large Chef's Kitchen with Italian Arabescato Marble Island and Custom Christopher Peacock Cabinetry, Wolf, Miele and SubZero Appliances with 106-Bottle Wine Storage, Sweeping Architectural Staircases, 2 Electric Gas Powered Fireplaces adorned in Pietra Cardosa SandstoneWalk in Closet, Laundry Room with Vented LG Washer & Dryer and Multi-zone Central Air.